We never planned to visit. We didn't even know a day trip to Orkney was possible (I know, I know- we need to research more). We arrived at John o'Groats, took the obligatory picture and wondered what to do next. It seemed like an awfully long way to drive, only to then turn around and go all the way back home again. Luckily, we parked the van at a great campsite (Dunnet Bay) and they had LOADS of great material about things to do in the local area- including day trips to visit Orkney. It turned out we could even take the motorbikes! (You can take cars, motorhomes, caravans- these are big ferries. Just be sure to book in advance if you need to go on certain days.) Here's everything you need to know to visit Orkney, including things to do and see, places to avoid and how to get there! Do I need a passport to visit Orkney? 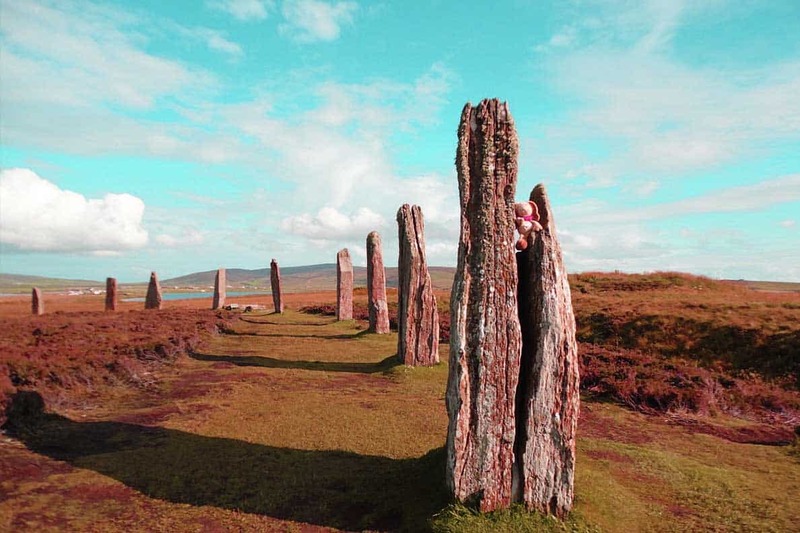 How much does it cost to visit Orkney? Just off the North-East coast of Scotland, Orkney is actually a collection of small islands. The largest, cunningly titled ‘Mainland', is just about the right size for a day trip- which is exactly what we did. You can see how close the islands are to mainland Scotland- much closer than I originally thought! So, how do you actually get to Orkney? There are two ferries from the north coast of Scotland, which in summer run several times a day. We chose to go outbound from Scrabster to Stromness via Northlink ferries and return from St Margaret's Hope to Gills Bay with Pentland Ferries. Yes, it was a little bit more expensive doing two singles instead of a return, but it allowed us to get the maximum exploring time by going from one end of the Mainland to the other instead of doubling back on ourselves. We thought that made more sense for our limited visit. It was quite an experience riding a motorbike onto a ferry- I'd never done it before and I was a little nervous- but in all honesty, it wasn't very difficult. The guys onboard knew what they were doing and in about 3 minutes they had the bikes secured, strapped down and ready to go. Seeing all those straps made me nervous for the crossing- but apparently they do that whatever the weather! Nope. Not at all. You might need photo ID if you have to collect tickets or if you have applied for some sort of discount on the ferry, but that's it. Easy peasy! In the middle of breakfast, we were excited to see Dolphins jumping around the bow. With my exceptional camera skills, I managed to miss EVERY SINGLE ONE…. but I have an awful lot of pictures of the splashes they made- as you can see in the video! The Millpond- aka the North Sea! One of the main tourist attractions in Orkney is the Old Man of Hoy- a rock formation which funnily enough is on the Isle of Hoy. We weren't going to Hoy but we were pleased to find the ferry sailed straight past it and we got a fabulous view! The approach to Stromness was absolutely breathtaking. Yes, we struck lucky with the weather, but winding around the top of Hoy and seeing Mainland and the other islands appear before us was like entering a magical wonderland. As sailors, we've always loved approaching new lands and exploring harbours- this place was absolute heaven for us. We both wished we had a small sailboat to explore all the little creeks and inlets which we passed. Just a shame it's in Scotland and the weather is not like this very often!! When we docked, we dutifully headed off the ship and set off on our whistle-stop tour. We used the tourist map as a guide and followed the road signs, which were very good and exactly as you would expect on British roads. The first place we headed for was Skara Brae, which is apparently one of the best-preserved Stone Age villages in Europe. However, just as we got off the bikes in the car parks, 7- yes, SEVEN- large coaches pulled up and unloaded their passengers. That's roughly 500 people queueing and waiting to go to the same small exhibit! Not at all what we had in mind. We thought about launching the drone to see the village from the air, but there wasn't anywhere suitable that was away from roads and people, so we decided to head on to the next attraction and hopefully beat all the other tourists there. This strategy actually worked out really well. When we arrived at the Ring of Brodgar (a ring of huge standing stones, similar to Stonehenge), there were very few people around and we were able to wander among the stones almost by ourselves for about 20 minutes. It was really cool how you could actually touch the stones and imagine just how many people had done that over the previous years. It's a UNESCO world heritage site and was built around 2500-2000BC. As with other stone rings, there is some debate about what it was used for- religion, astronomy, social gatherings, burials- but not knowing adds to the mystique! Whatever you believe, I totally recommend a visit. It was free as well, which was incredible. Kirkwall is the capital city of Orkney- and by capital I mean largest village. Or perhaps a small town. There are hundreds (ok, maybe 20) of cafes/ restaurants and some gorgeous boutique shops with all sorts of beautiful things you don't need but really want. I confess I bought some “Wandering Bird” earrings- earrings with little silver birds on. One big advantage of being on the bike is having to say no – I could easily have spent a fortune on stuff but my bank account was very grateful I couldn't carry them home! One of the main attractions of Kirkwall, apart from the food & shopping, is St Magnus' Cathedral. Riding in Orkney is very easy. The roads are tarmac (tarmacked??) and signposted and the traffic is not very busy at all. It's mainly single track ‘A' roads- don't think we had any dual carriageways and certainly no motorways, so there is plenty of time to look around you and enjoy the incredible views. There's a lot of farmland and green open spaces, with peeks of the sea beyond. For some reason, I expected there to be more mountains- like the Scottish Highlands, but it was relatively flat with a few moderate hills at best. After a relaxing lunch in the sunshine, we headed off on the last leg of our journey to catch the ferry. We stopped at the Italian Chapel (where a lot of Italian POWs were sent to build barricades against German submarines.) Whilst they were here, they built this beautiful white chapel, which stands as a complete contrast against the fairly bleak landscape. The Orcadians are very proud of this chapel and work hard to keep it in excellent condition as a memorial to the war and a hope for future peace. The Italian Chapel is right by the start of a series of bridges which connects the small islands of Burray & South Ronaldsay to Mainland. Just as we were crossing the first of these bridges, we suddenly found ourselves in the middle of a deluge! Seriously, it rained so hard we couldn't see the road in front of us- tough in a car but impossible on a bike. We skidded into the next turn off and gratefully saw the sign ‘cafe'. The poor staff probably didn't know what to think when we appeared in the doorway, soaked through and looking very sorry for ourselves! Luckily they provided us hot drinks and cake- and our misery passed as quickly as the storm (about 10 minutes) Apparently freak downpours like that are very common in Orkney- which we found incredible considering how warm and beautiful it had been earlier in the day. Having thoroughly dried out, we set off to get to the end of South Ronaldsay- just so we could feel we'd done the island ‘properly'. In truth, we were kinda done with sightseeing now- and still a bit soggy- so we would have happily got an earlier ferry… but there wasn't one so we made the best of it and explored the island as far as we could. It was still a lot of farmland and some pretty views of the sea. This sea is actually the famous Scapa Flow, which played host to the British Naval fleet during both World Wars. It was from here that the Great Fleet set out for the Battle of Jutland in 1916 and also where the German fleet was bought to after the 1918 Armistice before it was scuttled. In WW2, HMS Royal Oak was anchored in Scapa Flow when she was torpedoed by a German U-Boat, which caused Churchill to order the building of the ‘Churchill Barriers' to protect our ships. The barriers can still be seen today. We actually really enjoyed learning about this period of history. As an ex-Naval Officer, I'd heard lots of the stories- but seeing it for ourselves made it a lot more real. The journey back was from St Margarets Hope back to Gills Bay (nr John o'Groats). This was with Pentland ferries . This ferry was slightly quicker than our journey out and only took about an hour. We sailed out over Scapa Flow and luckily the sea was as calm as before- although the bikes were still strapped down well. We arrived back in Gills Bay without incident and even made it to the Chippy in Castletown (Totally recommend these guys- we phoned them from the ferry and they had fish & chips all ready and waiting for us when we got there. We strapped the food to the bike behind me and it was still warm & delicious by the time we got back to the van- a perfect end to a day of adventure! All in all it was a great day trip- even with the downpour and a tired and slightly grumpy teenager. It was an excellent way to spend our time once we'd reached the north of Scotland and we recommend it to anyone. Yes, there is a lot of farmland and honestly a day or an overnight is probably enough- but there's so much history to explore. It's a fascinating island. YIKES!! That is definitely one of our more expensive day trips. However, we'd definitely do it again. There are ways to make it cheaper- book the ferries in advance; go on an organised coach tour; take your own food with you. But for an impromptu adventure, it was a lot of fun! How about you? Have you ever visited Orkney? Did you have any good or bad experience? Let me know in the comments below. What a cool day trip – I never thought it would be worth to go to Orkney for just one day, but it sounds like you fit in a lot! We’re doing the NC50 next year, so hopefully we can hop over for a day too!